iPhones are one of the best music playback devices. And the iPhone official music application, known as the Apple Music, is one of the best ways to access music on Apple’s Platform. However, as good as the app may be, many users face an issue with the app. They complain about the very low volume from the music app, despite of turning the volume all the way up using the Volume Up button. This is a known problem but it’s definitely not a bug with the software. In most cases it is due to a feature that’s built into iOS. In this guide we will tell you how to troubleshoot and solve this problem on your own, if you even face it. Tips: If you lost any precious photo or video from iPhone/iPad, you can always use Gihosoft iPhone Data Recovery to get them back from iOS device with/without backup. The iOS operating system is a very powerful mobile operating system that has numerous features baked into it, many of which people aren’t even aware of. One such feature is to limit the volume so as to protect your ears during long music listening sessions. By default it is off, but sometime this feature may get enabled, causing the volume to decrease. Firstly open the Settings app on your iPhone. Then scroll down till you find the music app and then tap to open its settings. You can also search it in the top search bar. Look for the label “Volume Limit” in the list of settings that are presented. You can also search directly for Volume Limit from the search bar at the top of the main settings page. The Volume limit should be OFF. If it is turned on, We need to turn it off. Swipe the volume limit slider to the right so that the volume is full. When the slider is completely to the right, it means that there is no limit on volume and the Volume limit is turned off. Go back to the previous page by swiping from the left and verify that the label for Volume Limit says OFF. Now, just quit the music app and reopen it. Your problem should have been solved and the volume of the music would now be at normal levels like before on your iPhone. Another feature, that Apple has built in to its iOS operating system, is Sound Check. Many times, it happens that the song we are listening to, naturally has a low volume. This can happen during the encoding of that song file. If this is the case, then Sound Check feature comes in really handy. 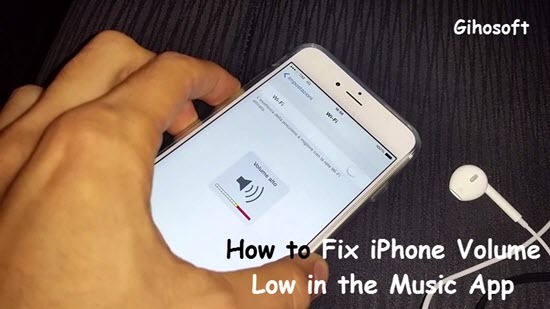 When it is enabled, your iPhone will automatically detect if a song naturally has low volume levels. 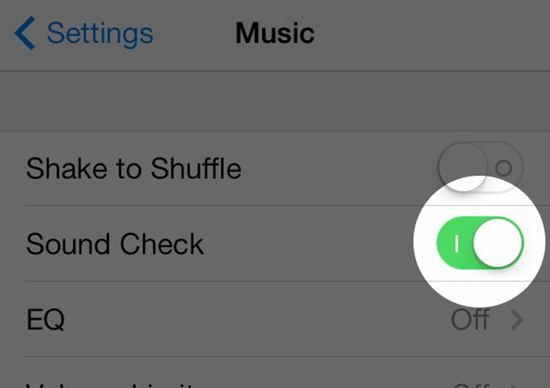 If it does, then iOS will automatically adjust the volume of the song. Follow the below steps to make sure this feature is turned on to handle the volume of such songs automatically. First open Settings on iPhone, scroll down to the Music label and tap it. Ensure that the Sound Check option is enabled. Then quit the music app. Reopen it and check if the volume problem is fixed. Mostly the low volume issue can be due to the Facebook app installed on your iPhone. Since the Facebook app automatically starts playing its videos inside the app, many time users would choose to mute the audio of these videos in case it sings at an improper time. This can cause an effect on the volume levels on the iPhone as well. Tap on More option in the bottom menu and then scroll down to the bottom where you will find the Settings option. Tap it to open the settings menu. 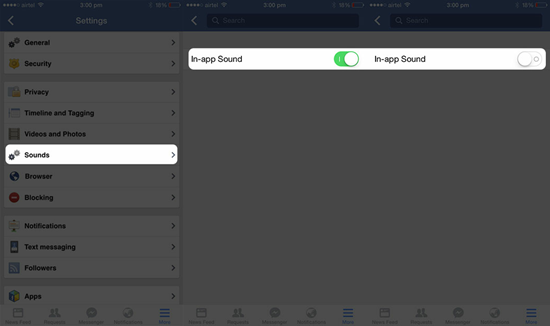 A menu will swipe up presenting you with three options: Account Settings, News Feed Preferences and Activity Log. Tap on Account Settings. In the next list of menu, Tap on Sounds option. Finally, turn off the In-App Sound setting. 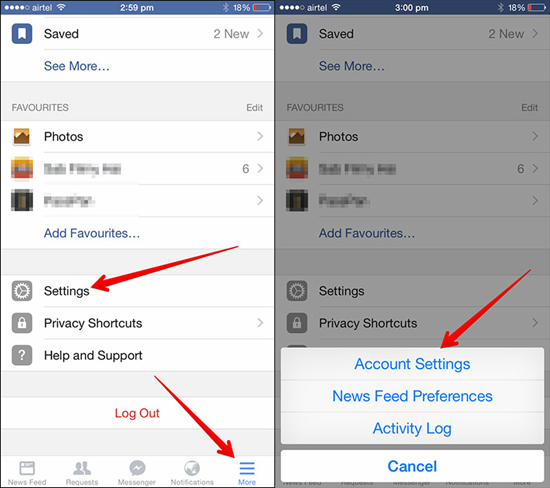 Afterwards, force close the facebook app from the multitasking menu. To be on the safer side, close out all the apps and restart the iPhone as well. Doing this should solve the issue of low volume on your iPhone. Our iPhones also have an EQ setting built in, which, when not tuned or working well, can lead to lower volume levels from the music app. 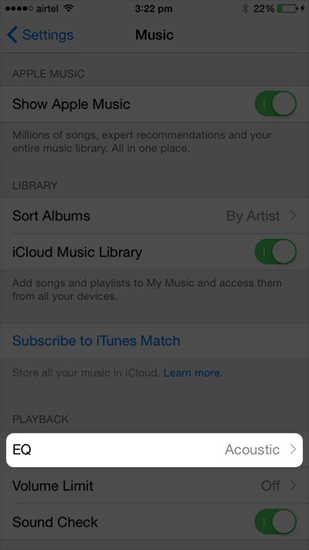 Open the Settings app on your iPhone and scroll down to the music app label. Tap on it to open the music settings. Scroll down to the PLAYBACK section and check whether the EQ setting is on or off. If it is showing a music genre name that means it is on and that might be affecting the volume levels. Tap on the EQ option to open additional settings. Tap on the first option of Off from the list that opens under EQ. So, we have listed all the possible solutions to solve low volume issues on your iPhone. In majority of the cases, one or more of these steps should solve the volume problem on your device. However, there is always a possibility that even these steps may not yield any fruitful result. In that case, there might be something wrong with the component inside your iPhone, which is responsible for the audio output. The device would then need to be taken to an Apple service center for repair. We hope this guide will be useful to you. If you have any question or other useful tips, welcome to share with us by commenting down.